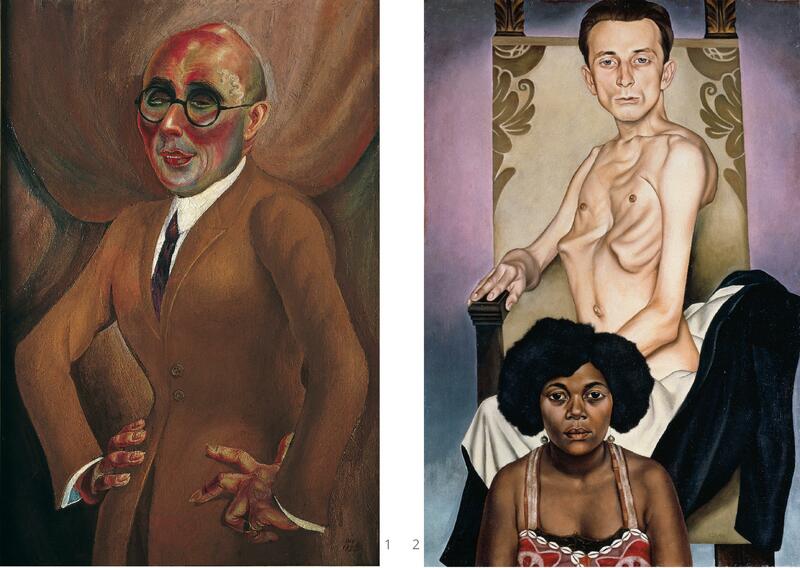 the dominant artistic trends of the Weimar Republic. 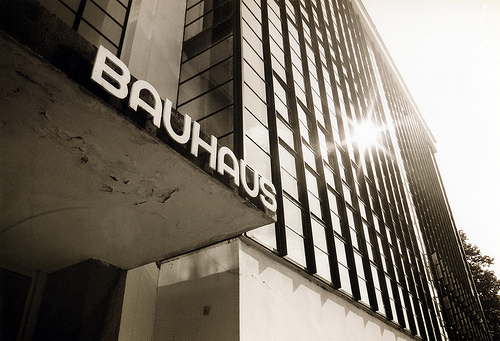 than 50 artists essential to understanding 20th century German modernism. both the similarities and differences between the movement’s diverse media. 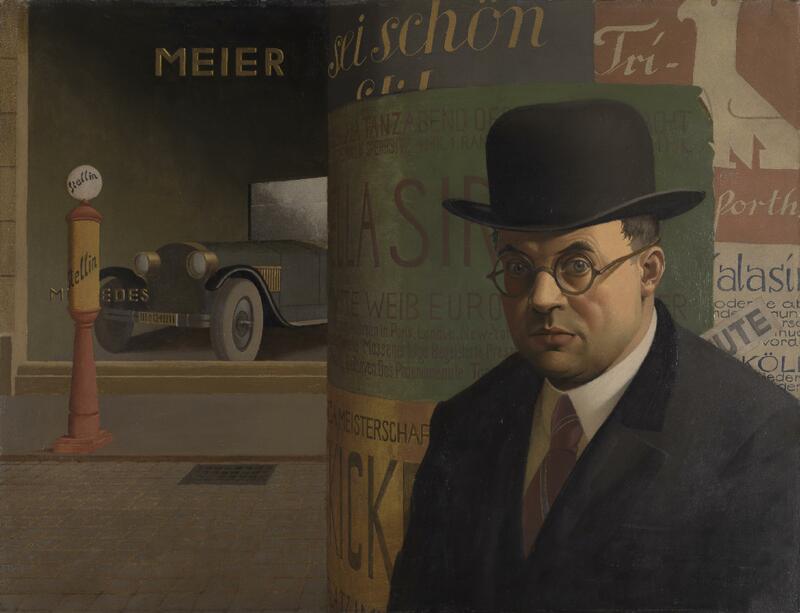 This new turn to realism, best recognized by a 1925 exhibition in Mannheim, Neue Sachlichkeit (of which New Objectivity is the English translation), has at times been called Post-Expressionism, neo-naturalism, Verism, and Magic Realism. 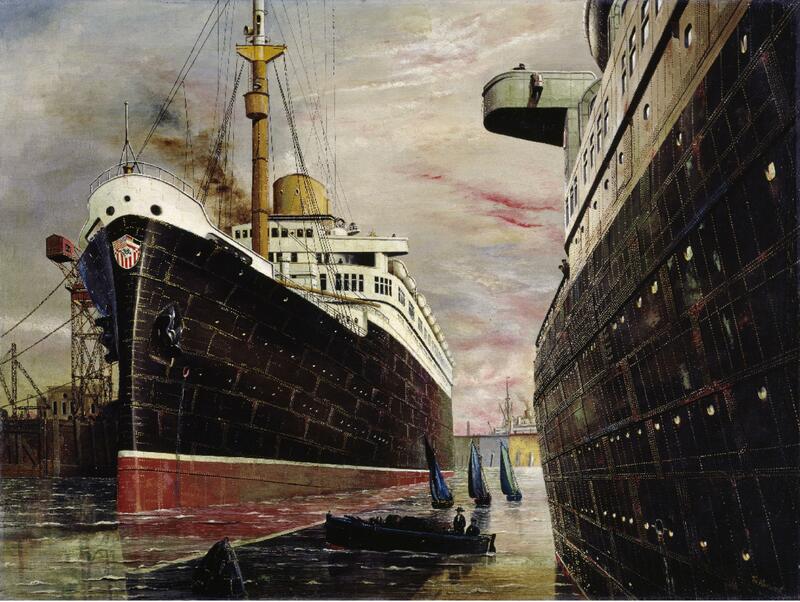 The diverse group of artists associated with this new realism was not unified by manifesto, political tendency, or geography, they shared a skepticism regarding the direction Germany society was taking in the years following World War I and an awareness of the human isolation these changes brought about. Germany’s financial, sociopolitical, and emotional defeat in World War I took a profound toll on the nation. In contrast to their Expressionist predecessors—who had enthusiastically embraced the war before confronting its harrowing realities on the battlefield—practitioners of the New Objectivity movement were disillusioned with the complex realities of the new Germany. 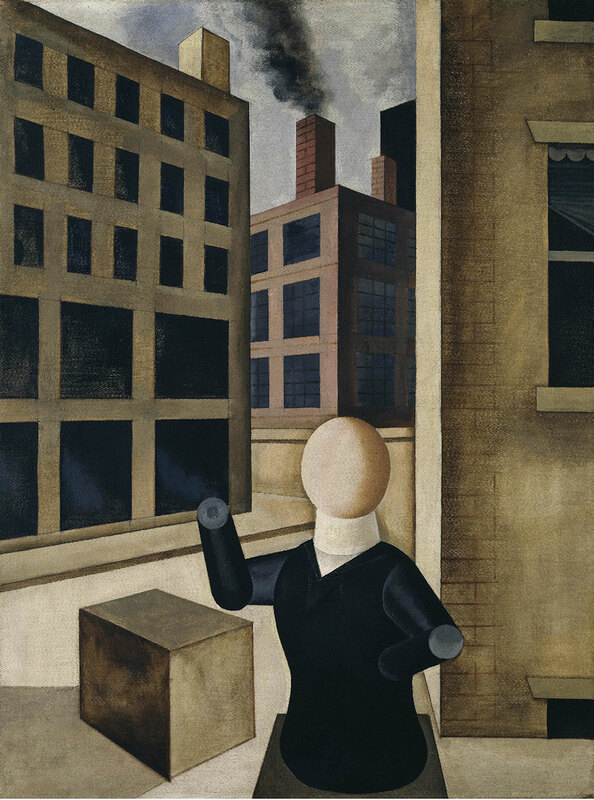 Digressing from Expressionism’s penchant for bold, abstract subjectivity, the Weimar Republic’s burgeoning group of artists favored realism, precision, objective sobriety, and the appropriation of Old Master painting techniques, including a nostalgic return to portraiture and heightened attention to the appearance of surface. One of the first problems that the Weimar Republic faced was Hyperinflation. 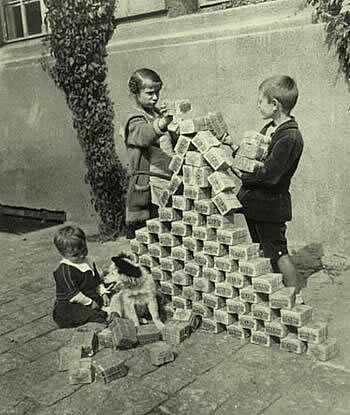 Money became so worthless that children could play with stacks of it. Highlights the disparity between victims of the Weimar Republic and the growing bourgeoisie that benefited from the deprivation of that period. 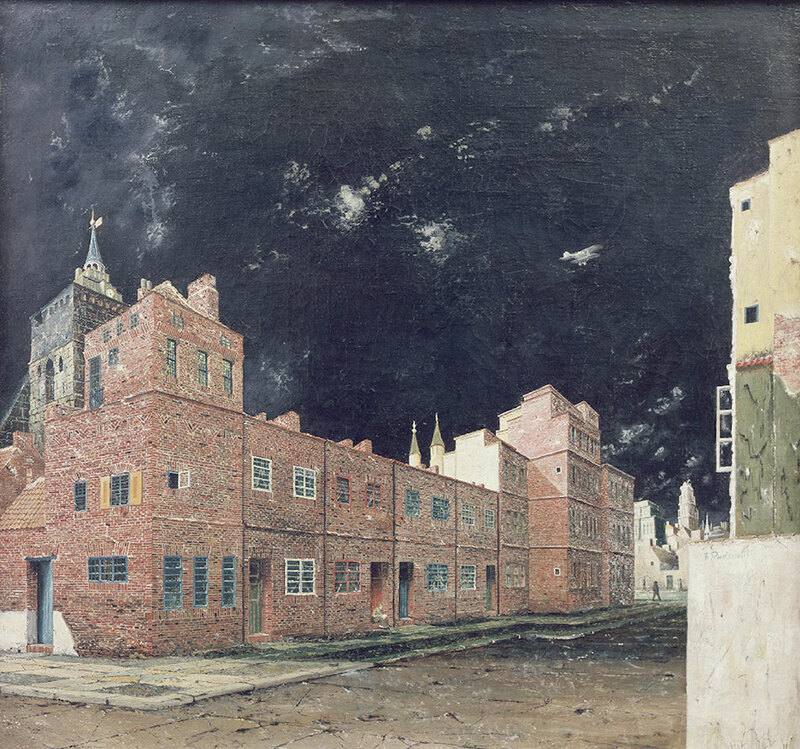 Artists such as Max Beckmann, Otto Dix, George Grosz, August Sander, and Heinrich Maria Davringhausen, portrayed urban landscapes highlighting postwar outcasts and their environs: the unemployed, disfigured, victims of violence, and prostitutes are set amid backdrops of bordellos, street corners and other scenes fraught with menace. 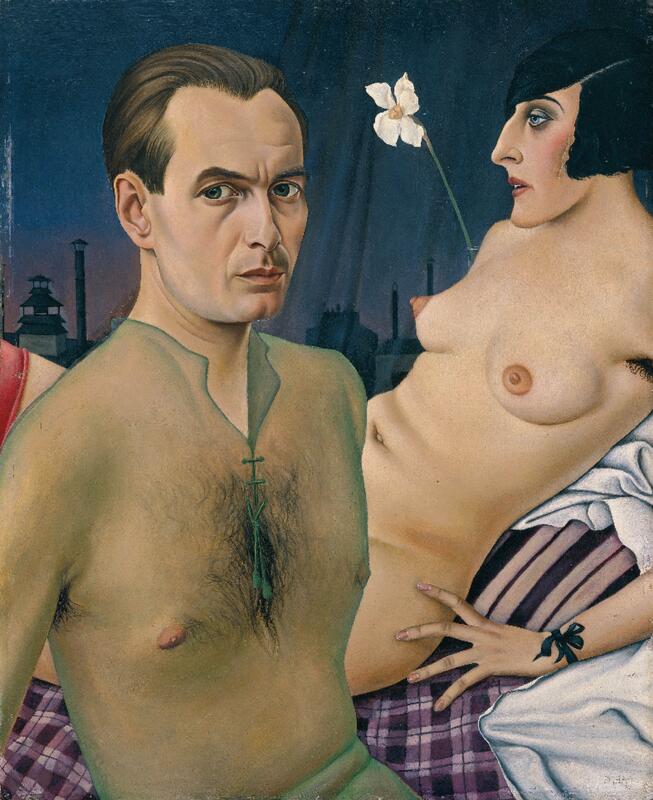 In contrast, the Weimar Republic’s burgeoning upper class was often depicted as corrupt and ruthless. Davringhausen’s The Profiteer (1920–21), for example, caricatures a common social type of the early Weimar era: the exploitative businessman making his fortune during the period of hyperinflation. Davringhausen places his profiteer on the top floor of a skyscraper in a long, narrow room filled with windows that appear to be left open, as if there may be the danger of falling out. 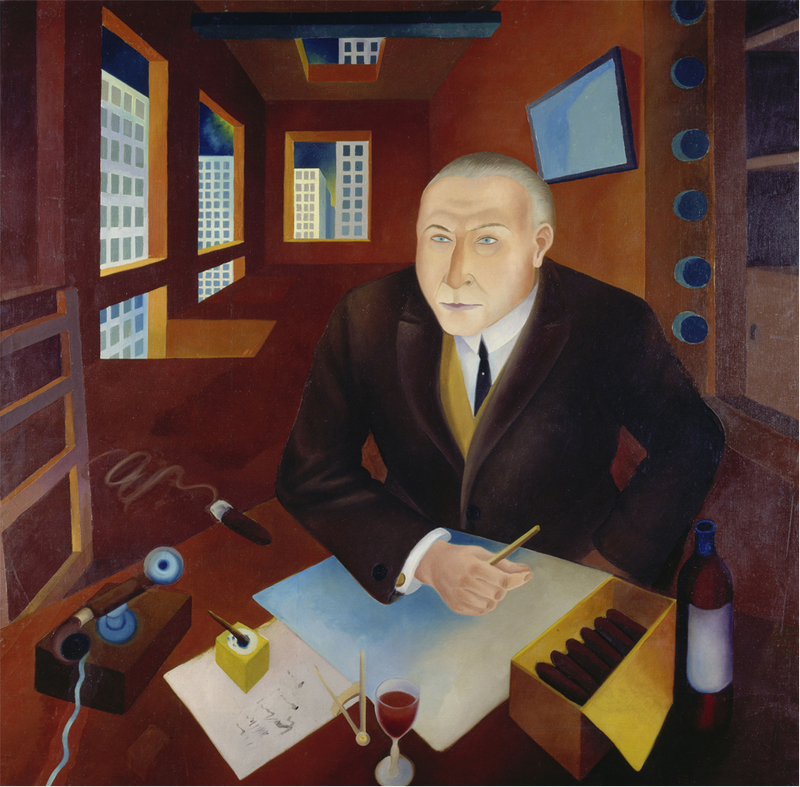 The brick red walls add to the psychological intensity of the hyper-modern space, in which the well-dressed businessman sits at his desk, enjoying a glass of wine and a cigar as he stares out dispassionately, avoiding the viewer’s gaze. Artists respond to the tensions caused by the effects of industrialization, which bled from cities into rural areas. As factories and jobs proliferated, Germany experienced a mass migration of its population from the countryside to urban areas. The notion of the city became associated with the future while the rural was nostalgically regarded as the past, and those who experienced the transition of migration were subject to feelings of displacement. 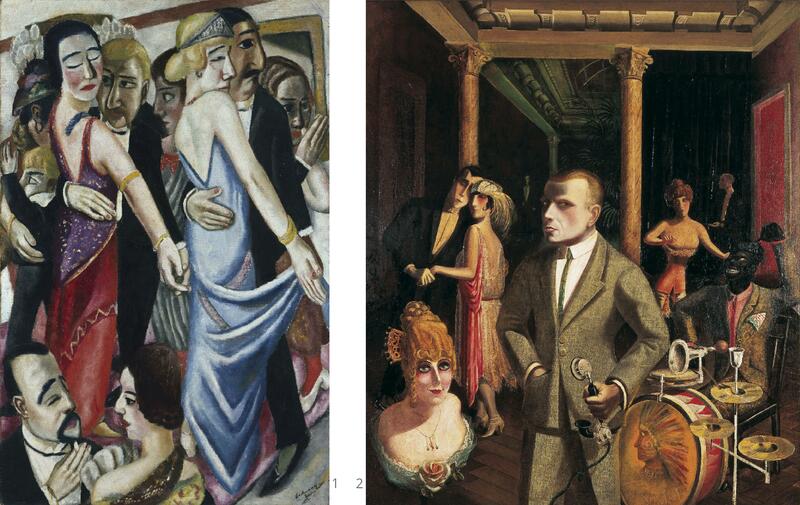 The complex relationship between the urban and rural reflected the disparate conditions of the Weimar Republic. In addition to artists such as Leonhard Schmidt, Gustav Wunderwald, Erich Wegner, Georg Scholz, and Anton Räderscheidt, this section features Arthur Köster, whose photographs of architect Otto Haesler’s Georgsgarten Siedlung represented architectural spaces using high-contrast lighting and experimental framing. In St. Georgs-Garten Siedlung, Architekt Otto Haesler, Köster’s human subjects, dwarfed by the buildings’ geometric rigor and frozen in the composition’s overriding sense of stillness, suggest an apprehension toward the new, modernized Germany; meanwhile, his images portraying the green spaces of Georgsgarten Siedlung distill nature through the lens of industry. 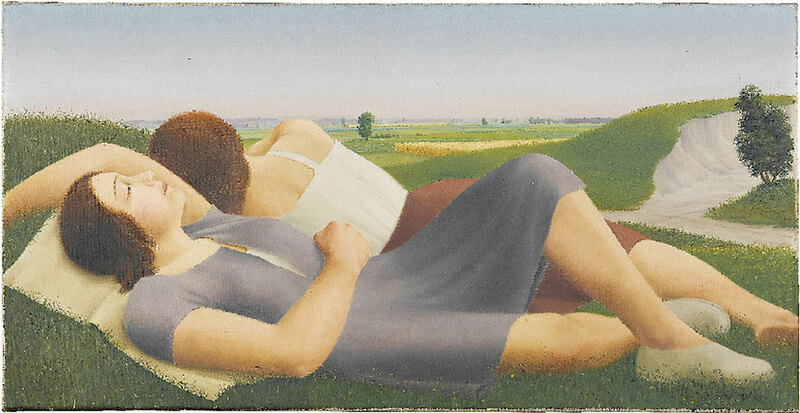 Georg Schrimpf, Reclining Girls in the Countryside /Liegende Mädchen im Grünen), 1930. Oil on canvas; 21 ¼ x 39 ¾ in. (54 x 101 cm), Staatsgalerie Stuttgart, photo © 2015 Staatsgalerie Stuttgart. Franz Radziwill, The Street (Die Strasse), 1928. Oil on canvas; 20 7/8 x 17 11/16 in. (53 x 45 cm) Museum Ludwig, Cologne, © 2014 Artists Rights Society (ARS), New York/VG Bild-Kunst, Bonn, photo: © Rheinisches Bildarchiv. Proposes a new form of the still life, meticulously staged compositions that might be called object-portraits. Zeroing in on disparate, banal objects of everyday life, these images represent things as markers of modernity and mass production. This section sees a recurring motif of cacti and rubber plants—“exotic” plants that were common in households at the time—and includes work by Aenne Biermann, Georg Scholz, Albert Renger-Patzsch, and Finsler, among others. 1. 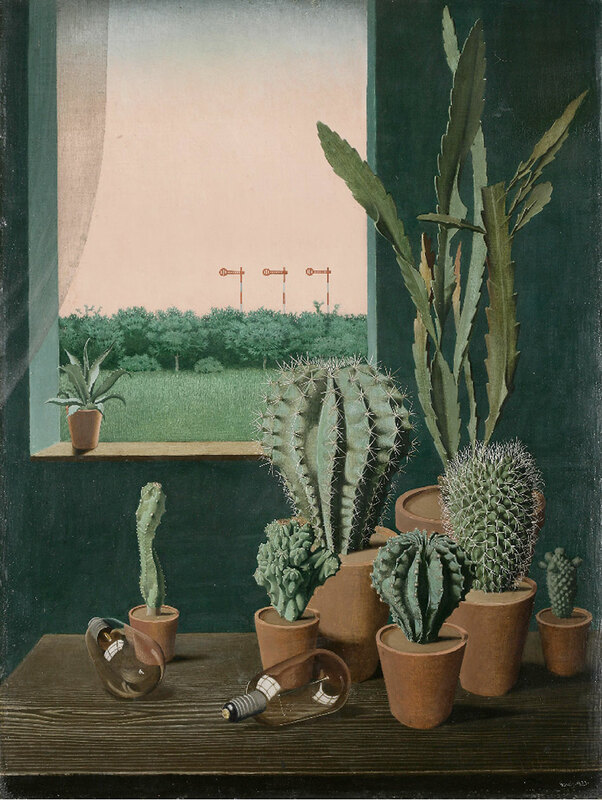 Georg Scholz, Cacti and Semaphore (Kakteen und Semaphore), 1923. Oil on hardboard; 27 3/16 x 20 9/16 in. (69 x 52.3 cm) LWL-Museum für Kunst und Kultur, Münster, Westfälisches Landesmuseum, © 2014 Artists Rights Society (ARS), New York/VG Bild-Kunst, Bonn; photo LWL-Museum für Kunst und Kultur, Münster (Westfälisches Landesmuseum), Münster/Rudolf Wakoningg. 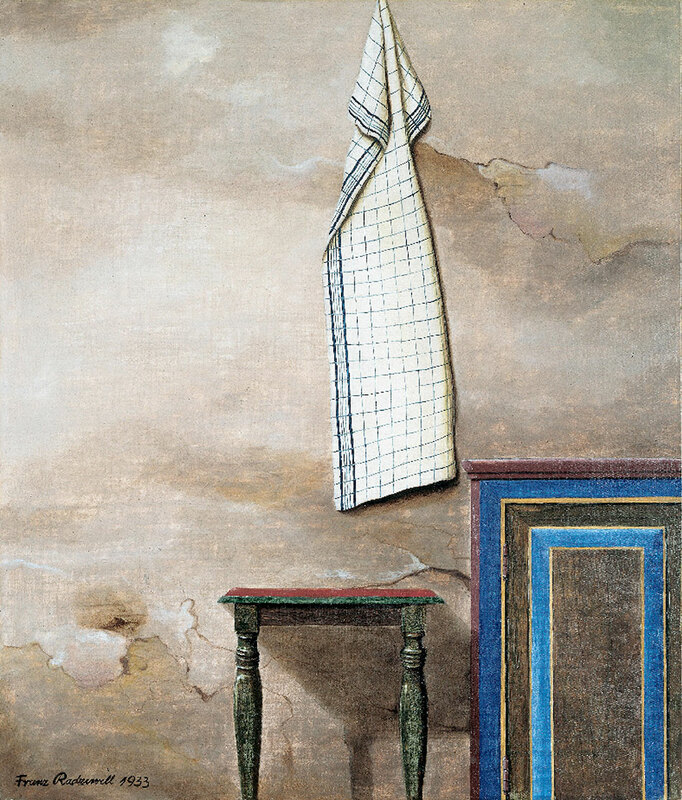 Franz Radziwill, The Handtowel (Das Handtuch), 1933. Oil on canvas on wood; 20 11/16 x 33 7/8 in. (76 x 99.5 cm), Radziwill Sammlung Claus Hüppe, courtesy Kunsthalle Emden © 2014 Artists Rights Society (ARS), New York/VG Bild-Kunst, Bonn, photo by Fotostudio Blatterspiel & Haftstein, Wardenburg. The penultimate section of New Objectivity, highlights artists’ attention to the Weimar Republic’s advancements in technology and industry. 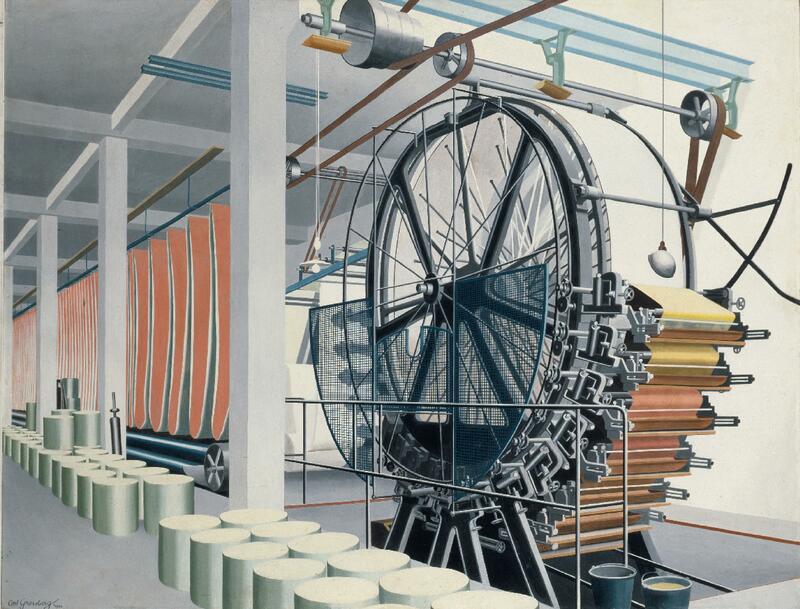 While some were skeptical about the lack of humanity found within networks of new machinery, others acknowledged the transformative power of technologies and sought new ways of conceiving man’s relationship to industry. Photography plays a key role in this section, not only commenting on its newly accepted position as an art form, but also serving as a key influence for painters such as Carl Grossberg, who executed paintings of factories with photographic precision as seen in Paper Machine (1934). Additionally, some artists, such as Renger-Patzch, attempted to bridge the psychological divide between the natural and the industrial by drawing structural parallels between machinery and botany. 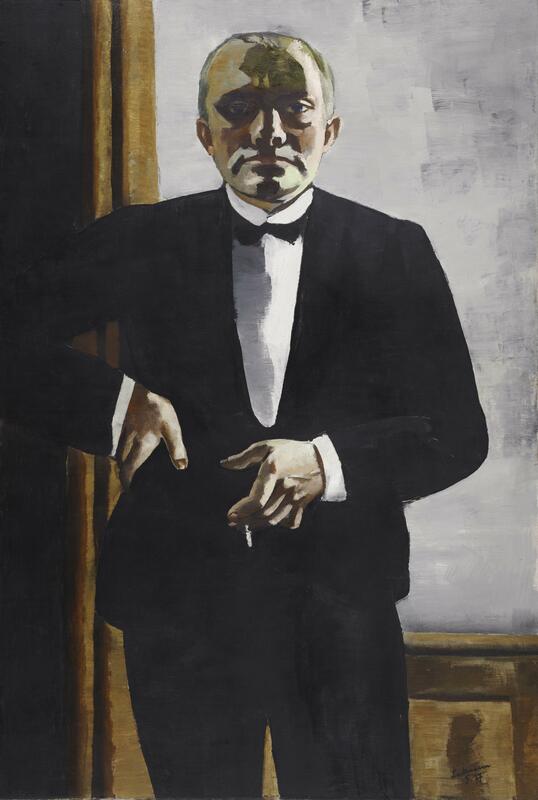 One of the most iconic images to derive from this new trend informal realism is Max Beckmann’s Self-Portrait in Tuxedo (1927) in which he wears a smoking jacket and its class connotations like a costume and stares brazenly at the viewer. 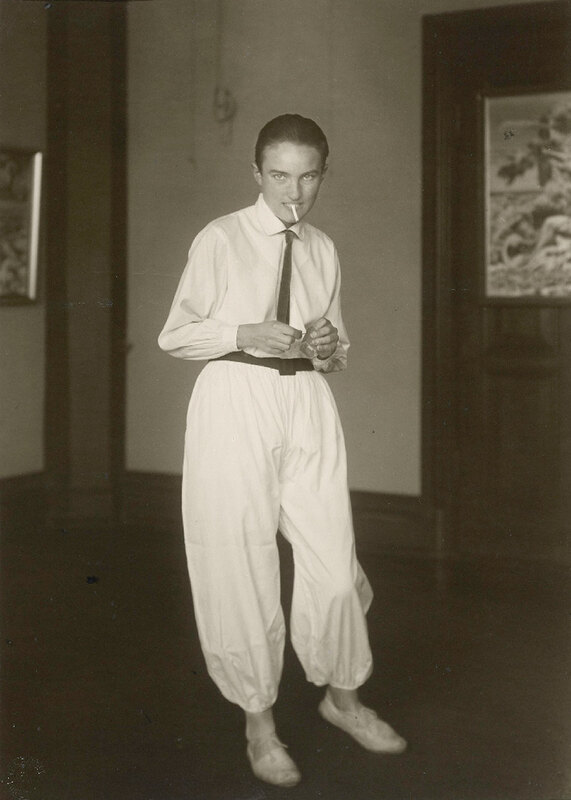 Another of the most important practitioners of this new portraiture is August Sander, who photographed his many subjects in somber, unexpressive poses, which he then arranged according to profession. The faces captured in his unfinished series—his subjects are only rarely identified by name—form an indelible archive of Weimar society. * This exhibition was organized by the Los Angeles County Museum of Art in association with Fondazione Musei Civici di Venezia. Monday, Tuesday, Thursday: 11 am–5 pm. Friday: 11 am–8 pm, Saturday, Sunday: 10 am–7 pm. 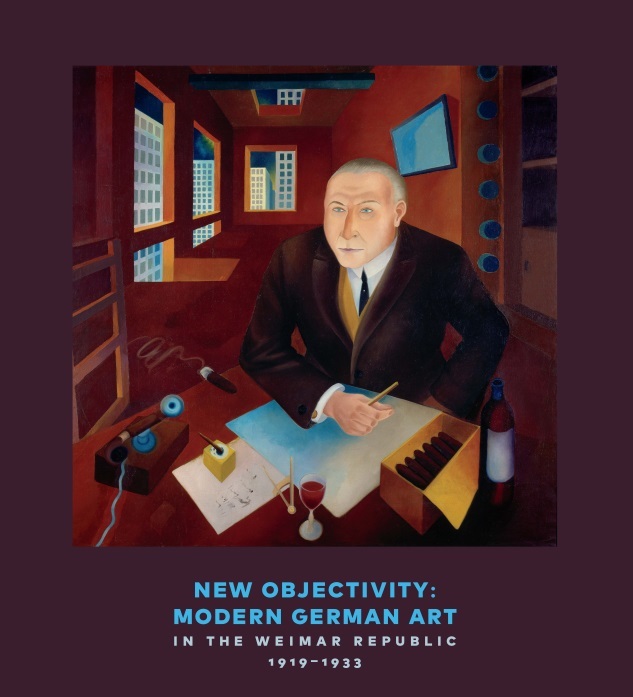 New Objectivity, edited by Stephanie Barron and Sabine Eckmann, provides fresh insight into artistic expressions of life in the Weimar Republic. 360 pages, 9.8 x 11.4 in. Available in both English and Italian editions. 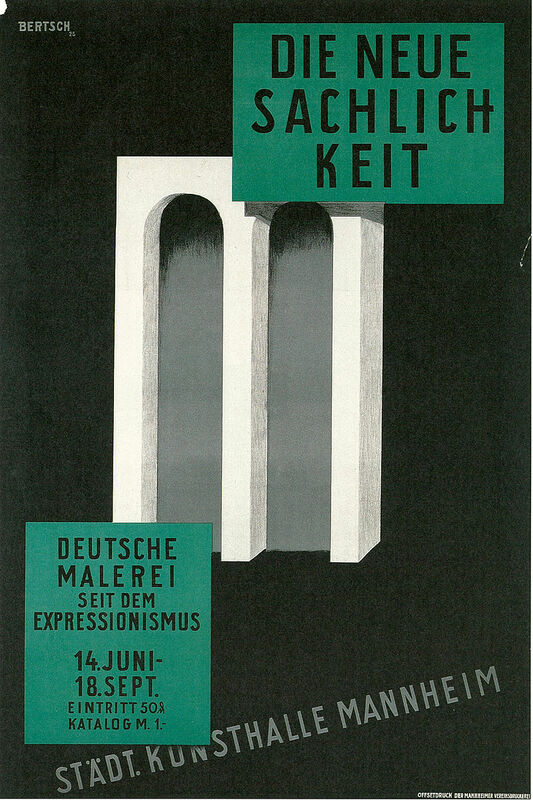 Between the end of World War I and the Nazi rise to power, Germany’s Weimar Republic (1919-1933) was a thriving laboratory of art and culture. As the country experienced unprecedented and often tumultuous social, economic, and political upheaval, many artists rejected Expressionism in favor of a new realism to capture this emerging society. Dubbed Neue Sachlichkeit— New Objectivity—its adherents turned a cold eye on the new Germany: its desperate prostitutes and crippled war veterans, its alienated urban landscapes, its decadent underworld where anything was available for a price. This book mixes photography, works on paper, and painting to bring them into a visual dialogue. 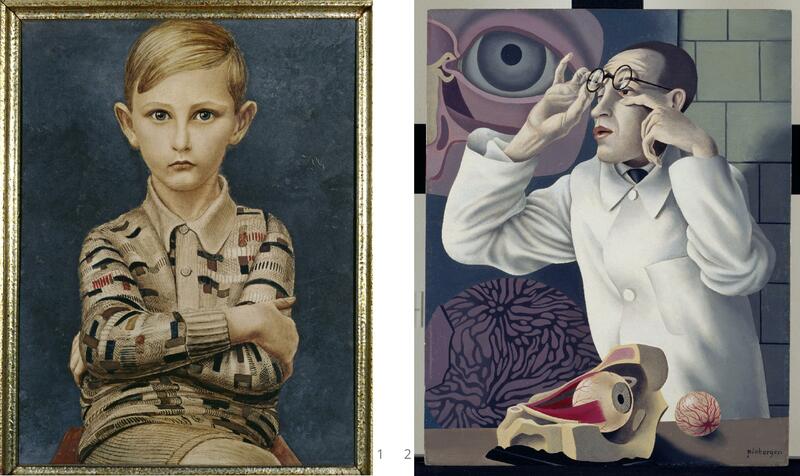 Over 50 artists such as Otto Dix, George Grosz, and Max Beckmann are included alongside Christian Schad, Alexander Kanoldt, Georg Schrimpf, August Sander, Lotte Jacobi, and Aenne Biermann. Also included are essays that examine the politics of New Objectivity and its legacy; its relation to international art movements of the time; the context of gender roles and sexuality; and the influence of new technology and consumer goods.This book was edited by Stephanie Barron and Sabine Eckmann, with essays by Graham Bader, Nana Bahlmann, Lauren Bergman, Daniela Fabricius, Christian Fuhrmeister, Keith Holz, Andreas Huyssen, Megan Luke, Maria Makela, Olaf Peters, Lynette Roth, Pepper Stetler, James Van Dyke, and Matthew S. Witkovsky. The exhibition is supported in part by the Art Mentor Foundation Lucerne, the Robert Gore Rifkind Foundation, Philippa Calnan and Suzanne Deal Booth. Additional support provided by Margo Leavin and Wendy Stark.